Posted by Nish on Tuesday, April 14th, 2015. Categories: Gigs, News, Stupid Show Title. I’m going on tour. Prepare yourself and your town for my arrival by erecting banners saying “NISH 4EVA” or “[Insert town’s name here] [drawing of a heart] NISH”. But most importantly buy tickets and encourage all your friends to do the same. 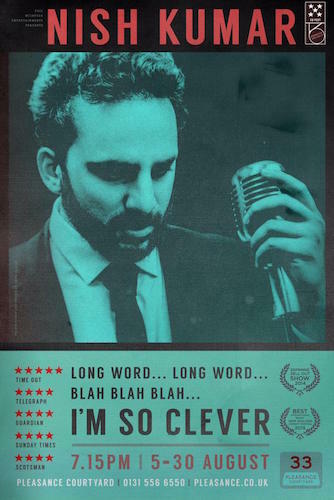 The show is called “Long word… Long word… Blah Blah Blah… I’m so clever“. It’s actually called that. TOUR DATES ARE AS FOLLOWS, ALL DATES & TICKET LINKS AS THEY’RE ADDED ON THE GIGS PAGE. 5th-30th August. Pleasance Courtyard, Edinburgh Fringe. 7.15pm TICKETS. Nish Kumar is represented by Chris Lander at Phil McIntyre Entertainments. Sign Up For Nish's Newsletter.